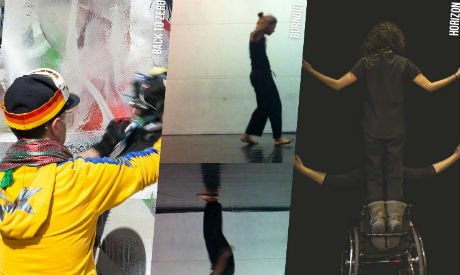 For its Urban Visions segment, D-Caf is presenting four street performances and a visual projection on 12 April in the streets of downtown Cairo. The contemporary dance performances – Burnout, Back to Zero, Horizons and Mix-Up – will be performed back to back starting 3:30pm. Burnout (Ziggurat) is a co-production created by Ezzat Ismail and Nermine Habib from Egypt and Flóra Eszter Sarlós and Krisztián Szilágyi from Hungary. The street dance routine explores the symptoms of a collective social burnout, where more and more people struggle with mental health and finding balance, desperately seeking deeper connections. Back to Zero is an interactive dance performance with calligraphy by German artist, choreographer and dancer Kadir Amigo. Amigo explores hidden places and attempts to transform and reclaim them through the act of dancing and writing, as he interacts with and draws inspiration from the urban heritage he encounters. Egyptian choreographer and dancer Shaymaa Shokry presents Horizons, a unique project in collaboration with dancers with disability. The piece explores tolerance and connection, and seeks to deconstruct mental and physical barriers giving space and time to self-expression and listening. On a lighter note, the acrobatic performance Mix-Up, from Egypt, seeks to engage with audiences through comedy and circus acts. Later in the day Parallel Projections will take place on the same street. The video-mapping show by Egyptian artist Islam Shabana and British video artist Josh Garner experiments with different mediums and technologies, accompanied by a soundtrack from Egyptian musician Ali Baghdady. Projected onto the surface of downtown’s historical Suez Canal Bank building, the imagery create an optical illusion and immersive experience.